Got a candy lover on your gift list? Easter candy, sweets and treats are the best goodies for your honey girl! 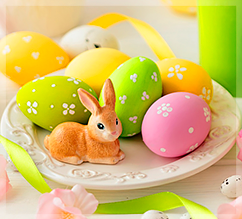 We provide you with sweet Easter deals you can’t miss. Send your holiday well-wishes to your loved one no matter where she is. Give her Easter bunny that will warm her heart. Make her day brighter and lighter with a bouquet of white lilies and her happiness will increase!